Whether you've been decorating for Halloween for years or are looking for something new, here are five easy and affordable decorating ideas to enhance your home. Tin Can Luminaries – these are especially easy and affordable, and can be created with any size tin can. You'll need a few other materials, a hammer, a nail and some paint. Using the hammer and nail, punch holes into two cans to spell out a fun-phrase like “Happy Halloween.” Paint over the exterior of the cans and add a candle in the middle. Chicken Wire Ghosts – this one is for the outdoors; but is still fun! All you need is some glow-in-the-dark paint and leftover chicken wire. Shape the chicken wire into the form of a ghost and paint. You can even add LED lights as eyes for an extra spooky effect. Pumpkins With Flair – pumpkins aren't just for carving, they also look great when incorporating your own personal style. Also inexpensive, you have many options to add to your design's appeal. Try a variety of buttons to form a fun face or tie a ribbon to the stem for some extra color. You may even try using some glue, glitter and rhinestones for a bedazzled look. Flying Bats In Your Home! - Perhaps you have a wall that is open and free of hanging art or other décor. Why not add a swarm of flying bats? Using black cardstock, cut out any number of bat shapes in different sizes. Fasten them to the wall in a flying formation and you're set! Halloween Wreath – This wreath will work inside the home or fits in hanging on the exterior of your front door. Start by purchasing a plain and simple grapevine wreath, available at just about any home décor store. Add strewn cotton for a spider web effect and any other fun items you can find, including fake spiders and small skeletons. Feel free to share any of your creations to our Facebook page; we're excited to see what you come up with. 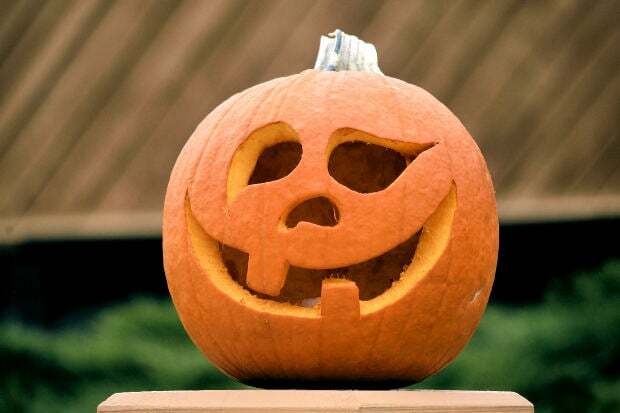 All of us at Lake Hallie Cabinets and Design wish you a safe and Happy Halloween!